The music industry has undergone one of the biggest revolutions over the past three decades. A countrywide survey by Research Co. provides a fresh look at how Canadians are listening to music, their willingness to spend money on it and their views on what today’s artists are earning. When it comes to music, it is safe to report that video didn’t kill the radio star, contrary to what the Buggles predicted in 1979. More than two-thirds of Canadians (69%) listened to music on the radio last week. There are some subtle differences in age, with those aged 55 and over tuning in to their radios more often than their younger counterparts (74%, compared to 67% for those aged 35 to 54 and 62% for those aged 18 to 34). A third of Canadians (32%) listened to music streaming services over the past week. Women are more likely to be doing this than men (37% to 27%), and those aged 18 to 34 are definitely embracing this concept. More than half of Canadians in that age group (54%) are streaming, while fewer members of generation X (35%) and baby boomers (17%) partake. There are no big changes among generations when it comes to listening to music files stored in a device (31% across the country). There is, however, a bit of a nostalgia factor for Canadians who listened to music on LPs, cassettes or compact discs last week. From a high of 31% among baby boomers, the proportion drops to 16% for generation X and 12% for the younger group. Recent years have seen a revival of classic and new albums in most formats, particularly LPs and compact discs, that are still appealing to a significant proportion of Canadians. In Atlantic Canada, more than third of residents listened to music this way last week. For 15% of Canadians, satellite radio is one of the options for music listening. This service allows subscribers to have absolute control over specific genres, decades and artists. In spite of the seemingly open domain of music listening, Canadians are not particularly happy to part with cash in order to hear their favourite artists. In the last month, only 19% of Canadians said they paid to access a music streaming service. The proportion of paid streaming subscribers climbs to 36% among Canadians aged 18 to 34 and to 25% for those in the highest income bracket. Even fewer Canadians (12%) paid for and downloaded a song online in the past month. Once again, those in the younger age group are more likely to have done this (22%) than members of the middle group (15%) and baby boomers (5%). Lastly, fewer than one in 10 Canadians (9%) bought a compact disc or LP record in the last month. The days of waiting outside the store for the latest release by a favourite artist are gone. Musicians are now showcasing albums entirely online. An important aspect of the debate focuses on how much money musicians make from their creations. When Napster transformed the industry in the early years of this century and brought with it the demise of record store chains, many musicians expressed dismay at their songs being downloaded and shared for free. It took years of lawsuits, changes to software and significantly superior downloading speeds to modify how the process works. Still, as the survey shows, Canadians are not parting with much money to access music. Across the country, a majority of residents (51%) say music creators are fairly compensated for their work, while one-third (33%) disagree with this assessment and 16% are undecided. Canadians aged 18 to 34, who are spending more on downloaded songs and streaming services than their older counterparts, are more likely to feel that the artists are making what they should be making (68%). Canadians over the age of 35, who are stingier when it comes to spending on music, are not as convinced (46% for generation X and 45% for baby boomers). The new era of popular music will provide two severe challenges for advertisers. First, our so-called “oldies” radio stations have started to add music from the late 1990s and early 2000s, as people age and the definition of “oldie” shifts. 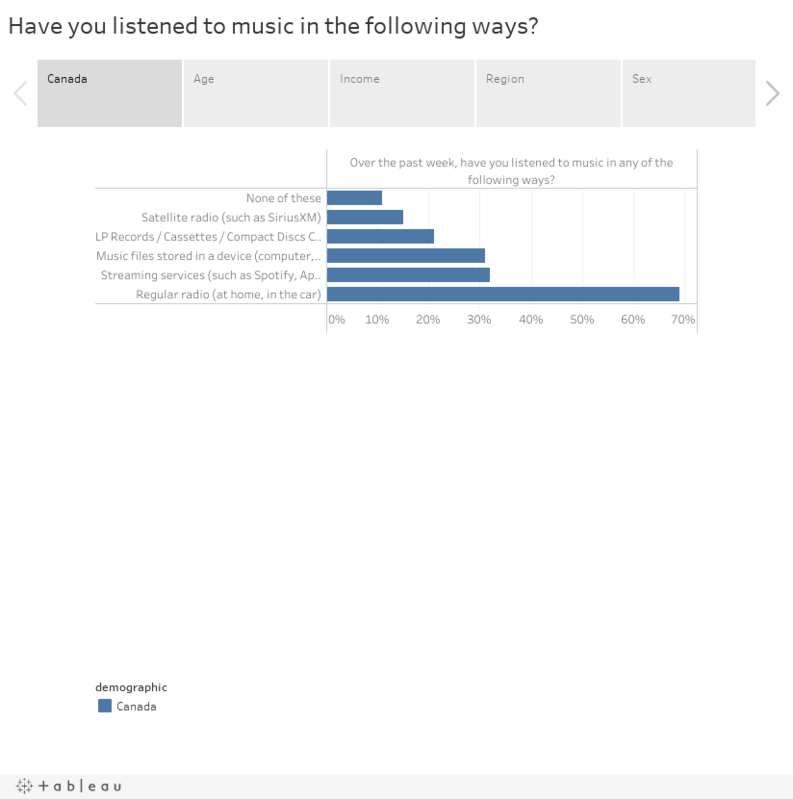 Most Canadians are still listening to music on the radio, and there is no significant change among age groups. Still, figuring out how to get their message across to Canadians will be tougher as formats modify. The second challenge is how to approach people in the 18-to-34 age group. As the survey has shown, they are more likely to already be spending money on downloads and streaming services than older Canadians. This is a group that is better prepared for today’s technology than baby boomers, and that did not experience the Napster craze in the early days of the “everything-is-free” internet that some members of generation X recall fondly. Canada’s youngest adults are willing to part with their cash to access the artists they like. The battle for their ears will define the future of the music industry. Results are based on an online study conducted from February 21 to February 24, 2019, among 1,000 adults in Canada. The data has been statistically weighted according to Canadian census figures for age, gender and region. The margin of error – which measures sample variability – is +/- 3.1 percentage points, 19 times out of 20.